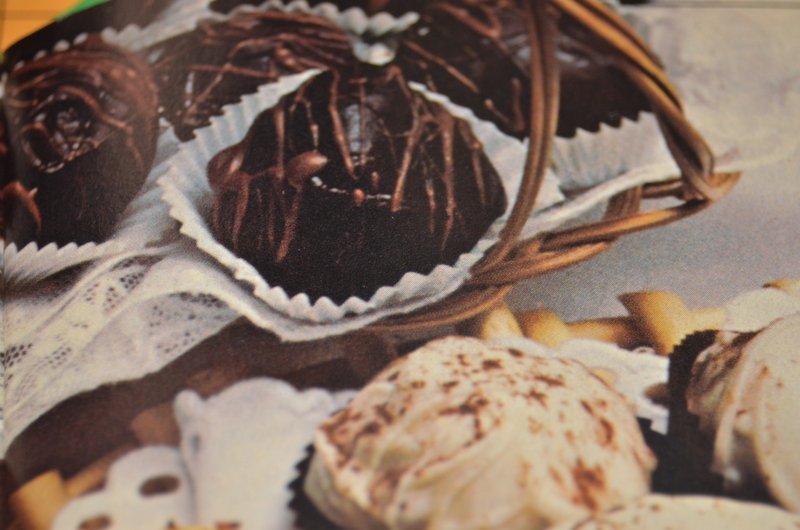 This recipe for Chocolate-Dipped Truffles with Amaretto-Chocolate Cream Centers comes to you from the Nov. 1979 issue of Cuisine. The recipe makes about 3 dozen. Heat cream in medium sized sauce pan to simmering; remove from heat. Add chopped semisweet chocolate and butter, whisking until smooth. Cool to room-temerature, and stir in amaretto and almond extract. Refrigerate covered in a medium sized bowl until firm (4 hours to overnight). Once set, scoop with a #100 scoop (or melon baller). Quickly roll into 1-inch balls. Freeze uncovered on baking sheets until hard (about 1 hour). Meanwhile melt milk chocolate to 92 degrees. Temper chocolate (or melt dipping chocolate). Dip centers decorating with milk chocolate and let harden.